Tempe Sister Cities believes that engendering international goodwill starts with providing assistance to pressing needs. After all, what else are friends for? Tempe Sister Cities collects wheelchairs to distribute to our sister cities who do not have access to proper medical supplies as part of our Wheelchairs for Peace program. 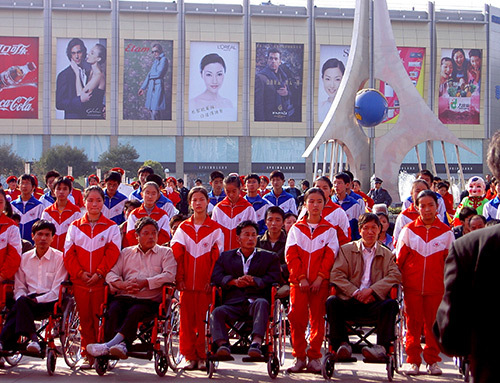 Over the past eight years, we have sent hundreds of wheelchairs to our sister cities in Timbuktu, Mali; Skopje, Macedonia; and Zhenjiang, China. In 2005, the U.S. State Department selected Tempe as one of five U.S. cities to be a "Partner in Peace" with a city in Iraq, pairing us with Hilla, Iraq, the capital of Babylon. Tempe Sister Cities partnered with Project C.U.R.E. to ship almost $400,000 of new medical supplies and equipment to the hospital in Hilla. The hospital serves the entire region of nearly half a million people but is chronically lacking sterile, useable medical supplies. Thanks to efforts by Tempe Sister Cities and Project C.U.R.E., the hospital now has tools to better serve its patients. In 1991, Tempe Sister Cities partnered with Timbuktu, Mali, our first sister city in a developing country. Our aim has been to improve the quality of life by providing Timbuktu with clean drinking water, responding to the needs of women and children, and restoring families’ livelihoods after a severe famine several years ago. Tempe Sister Cities has built seven drinking water wells in Timbuktu, giving people access to fresh water without having to walk miles from home. 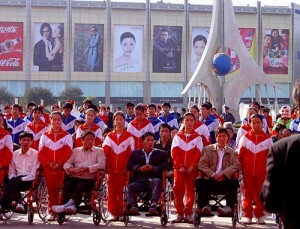 In partnership with the Wheel Chair Foundation, 240 wheelchairs were shipped to Timbuktu. With the Project Cure partnership, $400,000in medical supplies were sent to the Regional Hospital. Funds were also provided for the Hospital Administrator to study Parasitology in Phoenix. A millet grinder that allowed women to grind in minutes what had taken them hours to grind. Sewing machines provided in a partnership project with the U.S. Embassy in Bamako. Tempe Sister Cities has raised funds for the Women and Children’s Center, educational seminars to prevent the dangerous and painful practice of female circumcision, and to teach women to sew on hand-and-foot-powered machines. Funds for a six classroom elementary school for the children of Timbuktu have been provided. A soup kitchen event where Wildflower Bread Company partnered with Hackett House helped to increase awareness of the school project, and brought in additional funding for the school. Tempe Sister Cities launched the Goat and Sheep Fund to provide goat and sheep herders with new animals to replace those they lost in Mali’s famine. For as little as $30, a pregnant goat or sheep can be sent to a destitute family in Timbuktu. The animals will provide milk, wool and fertilizer, and eventually meat and leather. When the family breeds four offspring, they will give two to another family, propagating the cycle of self-sufficiency. Would you like to feel the joy of give an animal to a family in Timbuktu? Give a family the gift of livelihood and, at the same time, honor anyone you choose to designate. For $30, you can help a family get back on their feet. You will receive a certificate of appreciation, indicating the animal you’ve given and the person you wish to honor with your donation. You can also make a general donation to the Timbuktu fund. Please help make a difference today. Would you like to be a part of the vast humanitarian efforts of Tempe Sister Cities? Please volunteer! If you would like more information on how you can make a difference in the lives of people all over the world, please contact our Tempe Sister Cities Humanitarian Efforts coordinator today.